Do You Make These Mistakes When Running at Night? Run through beautiful southern California wine country as you travese through back roads of vineyards, rolling hills, horse pastures and stunning homesites. Staged at the gorgeous Monte De Oro Winery, running up some of the hills is worth the challenge knowing a glass of explicit wine is waiting for you at the finish. Half this course is on paved roads while the other half is on well maintained dirt roads. Miles 4 through 11 are out and back. Ready to race? 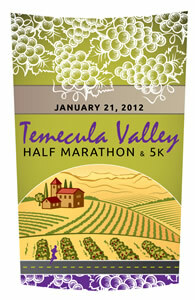 Register now and enjoy your Temecula Valley Half Marathon & 5k! We don't have a link to the race results page, would you like to add results for this race?